Great excitement. 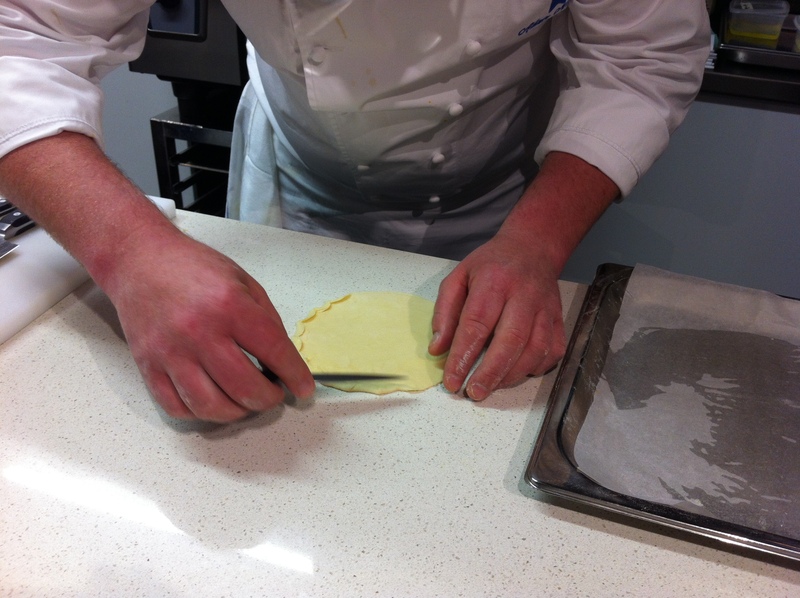 We get to use the puff pastry we prepared yesterday. 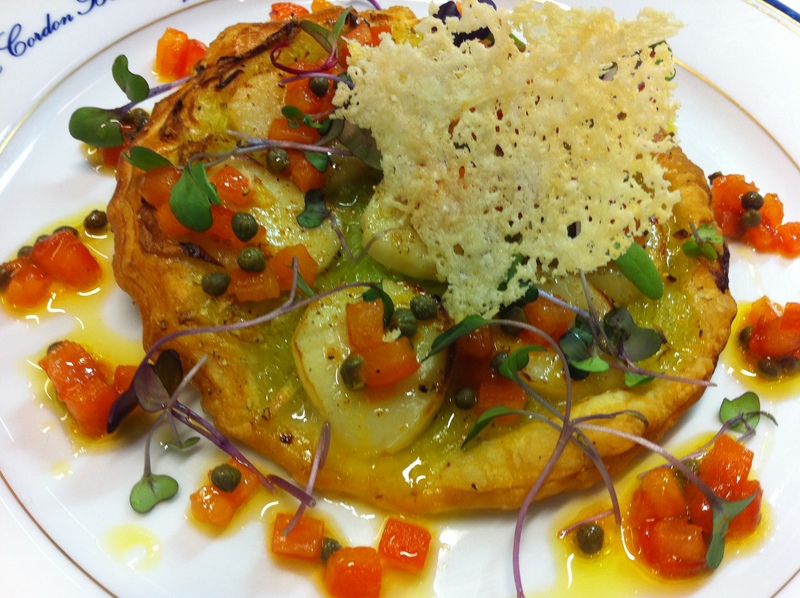 We’re making scallop and leek tarts with a saffron and caper vinaigrette. 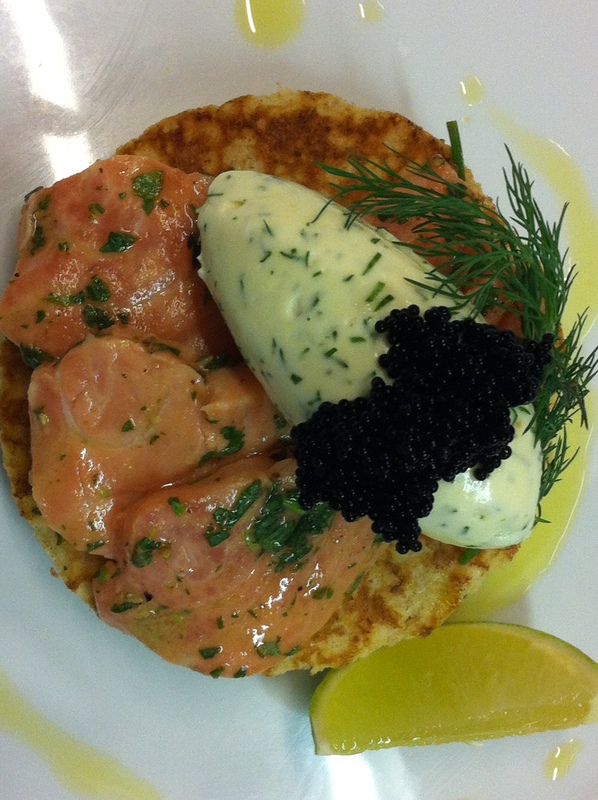 We’re also doing buckwheat blinis and marinated Akaroa salmon. As with every lesson, there are traps. The pastry has to rolled as thin as a pancake. Slice the leeks thinly so they don’t overwhelm the tart. Don’t marinate the salmon too long – just 10 minutes. Don’t use too much saffron in the dressing but on the other hand, don’t use too little. Make sure there are heaps of tomatoes in the vinaigrette. Chef is going through his paces. The smell of the leeks sweating in olive oil fills the room. It’s nine o’clock in the morning. You are all probably at work. I pinch myself. I am sitting in a lecture theatre with 13 other passionate cooks and I’m overwhelmed with happiness. I don’t want any of this to finish. The weeks are flying by. What will I do with my new skills post December 14? How can I incorporate food into my PR work? Can I justify doing the Intermediate course which starts in January? My daydreaming comes to an abrupt end when I realise Chef has moved through several stages and I haven’t written a single note. I whisper to Kimberley: “What else is infusing with the saffron? What’s Chef got in that pot on the stove? His finished dishes are perfection on a plate. The Tobiko caviar looks regal atop the dill speckled creme fraiche. He gently places the vinaigrette around the scallop and leek tart with a smattering of micro herbs. He makes a parmesan wafer for extra plate appeal. There doesn’t seem so much to do today. We’re only cooking tarts and blinis. The salmon marinade isn’t complicated, just fine herbs, lime juice and the Rolls Royce of mustards. 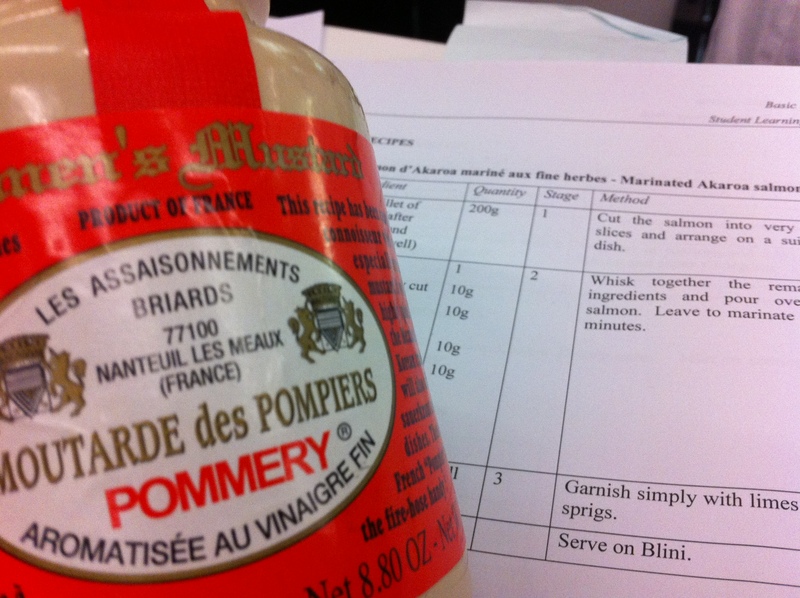 We’re doing the blini mixture in threes. I’m rolling the pastry and I can see that it’s too thick compared to the others even though it seems to cover the whole bench. Damn. I forgot to cut it in half – one half for today and the other for a tarte tartin later. Not to worry says Chef. It will still work, just make sure you lay the off cuts on top of each other (not scrunched up) so you don’t lose the layers. He’s right, of course. It looks fabulous, although not as good as Rodrigo’s who spends the rest of his week attending the patisserie course. Another week of learning to prepare and present exceptional food is over for me. I’m heading off to Martinborough with a boot full of unsalted butter to practise puff pastry making. Pie anyone? Justify, justify – this is clearly living the dream. Yes please I would love some pie – have been on Sunshine Coast and been eating succulent fresh king prawns twice a day for three days. Pies would make a nice change, just love reading your blogs and can’t wait for the next one. Do the intermediate Heather. The food life will come to you. Another wonderful post, with the most tantalising hints of what a dish contains and involves – its a great way to keep your devoted readers totally hooked! You are doing so well. Your passion is very evident and you are doing what you enjoy which is very special. I just about break into a sweat with your descriptions of timing and presentation being up to standard. Keep up the good work!